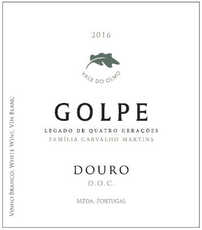 The grapes came from the oldest vines of Quinta Vale do Olmo, with more than 25 years. The grapes were harvested manually in September into 20 kg boxes and transported to the winery where they were chosen and subsequently stripped and crushed. Fermentation occurred in stainless steel tank with temperature control, during which bâtonnage was made. This wine has a distinctive deep yellow color. The nose is intense with aromas of ripe fruit, grapefruit and a minerality typical of this Douro blend. On the palate the wine has excellent structure and a marked acidity, which balances very well the wine. The end is long with citrus notes revealing a marked and balanced acidity. Best served at 8Cº-10Cº temperature.